Call it an on-location family vacation. 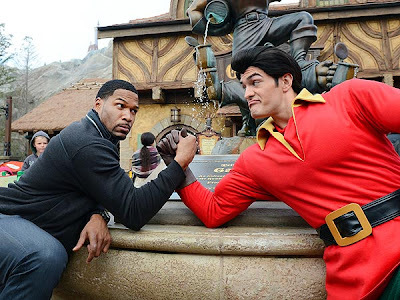 Kelly Ripa and Michael Strahan are taping four episodes of Live in Orlando, but the morning show co-hosts are also making time to embrace their inner children (and their real ones!) at Walt Disney World. The Live co-hosts spent the day with their families at the park on Saturday, where Ripa rode the Epcot attraction Test Track with her kids Joaquin (next to Ripa), 9, Michael, 15, and Lola, 11. Elsewhere, it was a tale of dueling biceps (and expressive eyebrows) when Strahan matched up for some arm wrestling with Beauty and the Beast character Gaston. Ripa's husband Mark Consuelos also joined his family on the trip, while Strahan was accompanied by his children, fiancée Nicole Murphy, and her kids. The Orlando episodes of Live will air Monday through Thursday on ABC.